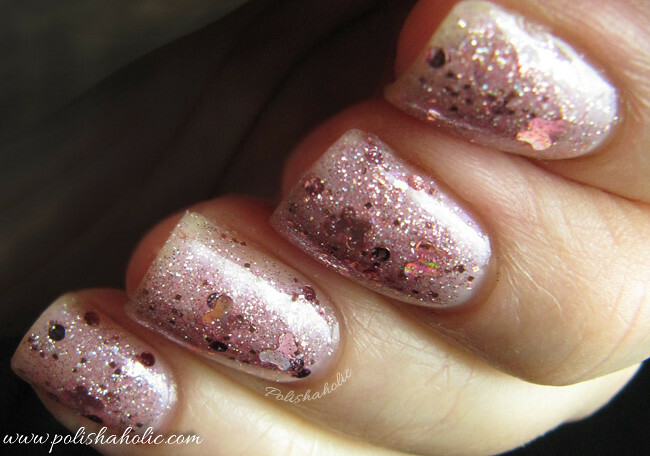 Nail Pattern Boldness Glitter A-Peel and Is Someone Loving You? Second post of the day and I was supposed to be posting less ;) I have fell behind on my posts and answering the comments, so I’m trying to catch up a little here. I also want to get this post out now cos Nail Pattern Boldness is having a restock tomorrow, Friday at 3 PM EDT and it’ll be the final restock for the Hello? collection. So last change to get yourself some of those beauties. Here’s one of them revisited, Is Someone Loving You? This is two coats of Is Someone Loving You? alone, no undies. A coat of Glitter Food and HK Girl top coat. Nail Pattern Boldness products can be purchased from their Etsy store. You can also find NPB on Facebook and Instagram plus they have a blog. This is probably old news for many of you and if you have a ton of those chunky indie glitters this might not be interesting to you at all. I believe there’s also a few of you out there that don’t own any glitter bombs yet and for you guys this post might be useful. So here’s a little tutorial of how I apply a polish that is packed with glitter and the products I love to use to get the best possible result. Nail polish I used for this is the first bottle of Jindie Nails I ever bought, Barney Blew Up. Before I start I usually turn the bottle upside down for a few minutes and shake it lightly. Here I have applied one coat of polish. I have a UV-gel coating protecting my nails so I don’t use any base coat. For the first coat I don’t try to get too much glitter. In fact I usually try to get as little as possible. Just apply a thin, even coat of polish. Now I’ve applied the second coat and for that I try to get a good amount of glitter too. It’s important to let each coat dry for a little bit before applying the next. If you try to work too fast you might drag some of the bigger glitters out of place. 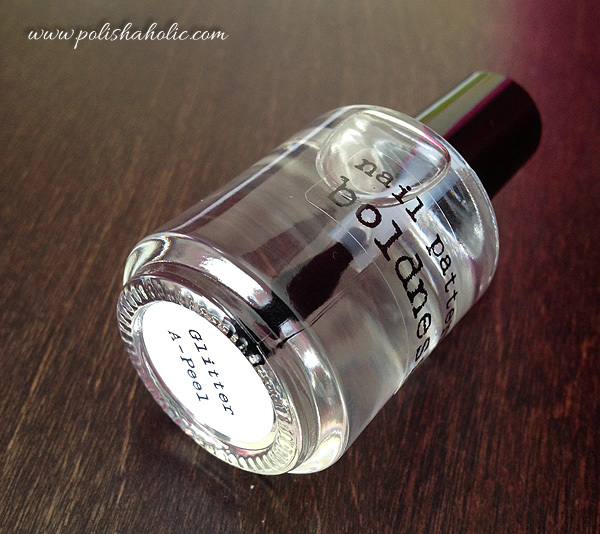 With this polish you can easily stop here, especially if you have shorter nails. I went for a third coat. So here’s three coats of Jindie Nails Barney Blew Up. I usually apply three coats cos I love the sandwich effect that these crelly based polishes have. But as you can see three coats can be a little rough looking. It’s not that bad IRL, camera makes it look a little bumpier than it actually is. So if you don’t mind feeling some of the glitter through your top coat you can just add your top coat right now or continue to the next step. I like a smoother result myself so I use Nail Pattern Boldness Glitter Food. This stuff is AMAZING!! It smooths these glitter bombs so nicely. I can’t live without it anymore and just ordered another bottle so there’s no risk of running out of it. So here is one coat of Glitter Food on top of the glitter polish. It dries a little cloudy so you will need to use a top coat of your choice to get your manicure to shine again. I got a bottle of Nail Pattern Boldness Glitter Food top coat to test and I’m in love! This top coat is thick and milky-ish and it smooths down even the grittiest glitter out there and creates a glass like surface. By itself Glitter Food dries a bit cloudy and matte looking but once you add a shinier top coat the sparkle is all there. You can also use this to fix your glitter polishes that have gone flat while sitting there in your polish drawer. Add some Glitter Food in to the bottle, shake and it’s all good again. 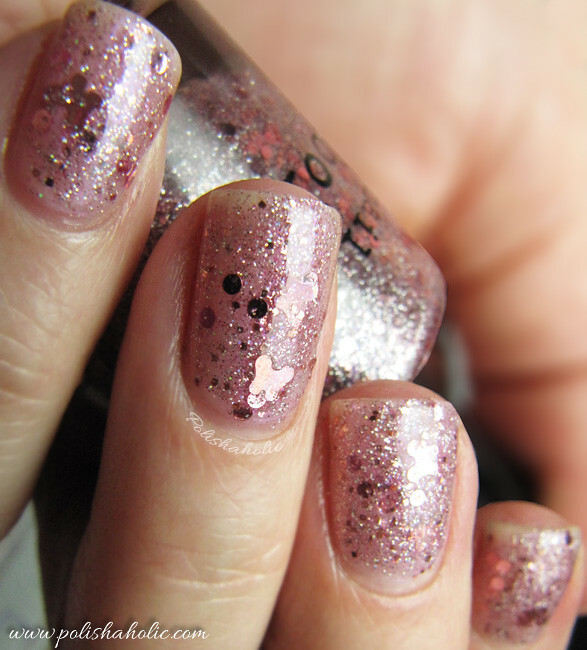 Glitter Food restores the needed thickness to the base of your glitter polish. Third way to use this is to help you create your own glitter or pigment frankens. Sometimes the clear base just needs that added thickness and suspension and that’s where Glitter Food comes in. This product is so worth it’s price!Over at Nail Pattern Boldness they have also begun to test this as a base coat for those polishes that need a perfectly smooth surface to be applied on. I myself will definitely try this as a base coat for acrylic/gel nails to see if this can hide the growing line that becomes visible even through your nail polish after a couple of weeks from your nail fix. I hate that visible line and that is one of the reasons why I’m still fighting with my peeling nails and keeping them natural instead of coating them with gel. I’d be a very happy polishaholic if Glitter Food could fix that problem for me. Only the glitter polish. You can see how the glitter is not totally smooth. I have now applied a coat of Glitter Food and you can see how it dries matte-ish. This is a little blurry but you can still see the smooth surface on the left side compared to plain polish on the right. Now I have added Inm Out The Door on both nails. You can see the shiny and sparkle is back on the left side nail and it also has this added depth that is missing from the nail with only Inm on it. Surface of the nail is silky smooth and shiny. Again a little blurry but you can clearly see the difference between the left side Glitter Food+Inm nail compared to the right side only Inm nail. Glitter Food rocks! I’m totally addicted to Glitter Food now that I’ve gone glitter polish crazy lately. I will need to order a couple of more bottles of this so I can try it on frankening too. I can’t make myself “waste” the only bottle I have on that right now. You can buy Nail Pattern Boldness Glitter Food from their store. You should also follow their Facebook-page and blog to get the latest info on new products and restock dates. ***This was sent to me for review. I also got their highly praised top coat Glitter Food. 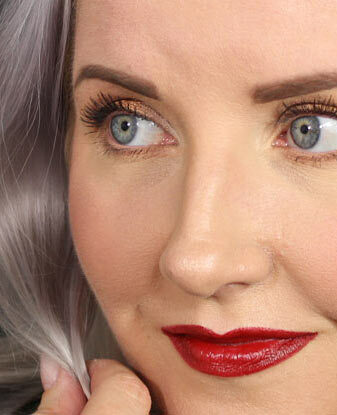 Many bloggers are totally in love with this top coat and for a good reason. 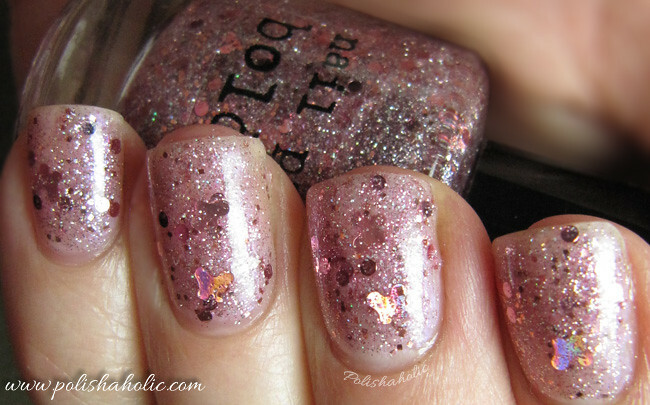 I’m going to test this out with few more glitter polishes and then write my review of it with some example photos. I can already tell you it really works though. I tried it with this polish and only used it on my left hand nails with a coat of Inm Out The Door on top of everything. On the right hand I only used Inm Out The Door and the difference is noticeable. Left hand Glitter Food nails have much more depth in them, glitter is shinier and the surface is smooth. Right hand nails look flat, duller and you can feel the glitter through Inm alone. Using Glitter Food also didn’t make the dry time for the manicure any longer. In this mani I used Essie Nourish Me x1, Essie Beam Me (whitening base coat) x1, Color Club Sugar Rush (sheer pink with a cold toned pink flash), Nail Pattern Boldness Glitter Food x1 and Inm Out The Door super fast dry top coat. 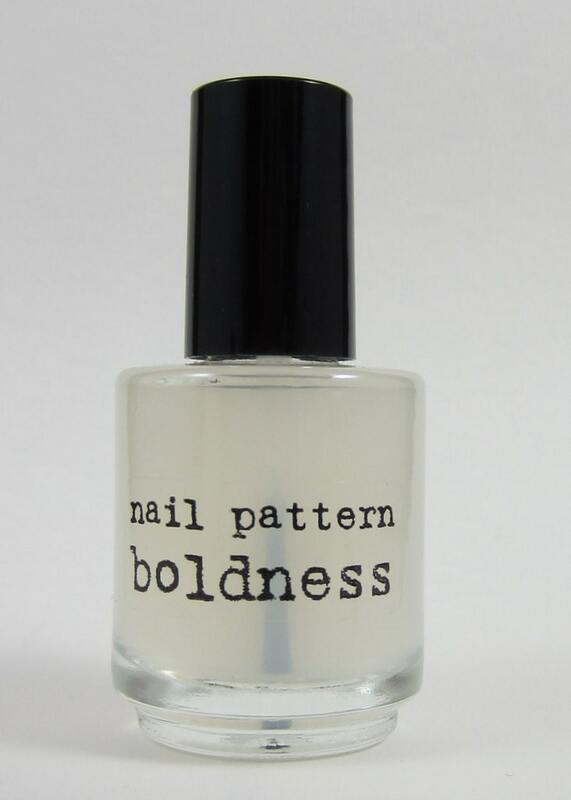 You can buy Nail Pattern Boldness polishes from their Etsy store. You should also “Like” their Facebook page to get the latest news and restock info. At the moment the Hello? collection is sold out but I believe there is going to be a restock next week. I’m sure the dates and time will be announced on their FB page. ***This was sent for a review.